Better late than never at The Bike-sharing Blog! According to Blog reader Angela Zhang, Hangzhou is China's first city with bike-sharing with a program that started this past May 1, 2008. 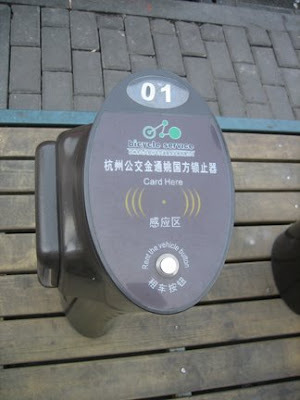 Called Hangzhou Public Bicycle Service, the program is sponsored by the local government. Starting with 8,100 bikes at 61 stations and now having 10,000 bikes at 350 stations, with stations roughly every 200 meters, this program is one of the largest in the world. 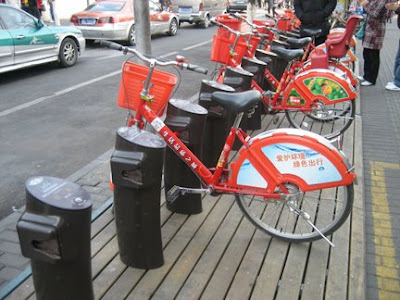 Zhang says the local government wants to have 50,000 bikes at 2,000 stations by the end of 2009. Also according to Zhang, between September 16 and December 31, 2008, there were 2.14 million rentals with the highest daily rental being 27,045 times in a day. "To rent a bike, people need to use their residential card or ID card to become a member and they need to pay 200 CNY ($29) as a deposit," says Zhang. The service is free for the first hour 2 CNY ($0.29) for the second hour, and 3 CNY ($0.43) per hour if more than three hours. Correction: When the program reaches 50,000 bikes, it will then have stations every 200 meters. Likely by the end of 2009, Hangzhou will be the bike-sharing capital of China and the world. Look out, Paris! Le point d'attache ressemble comme deux gouttes d'eaux avec les points d'attache de Paris. étonnant non ? The base looks like two drops of water with the attachment points of Paris. not surprising? During Hangzhou first year operation, no bikes were stolen and very few were damaged or vandalized compared to the half that were stolen or damaged in Paris.——from Wikipedia。Luckily, hangzhou does't copy this situation from Paris.and i think french people don't mind share their good experience to the other cities or countries.actually, in this case,they should learn some from Hangzhou.